For this week’s #AskAwayFriday I met Echo, a fellow mad mummy who blogs at Domain of the Mad Mommy. I love Echo’s sense of humour as she tackles the trials of being a parent to a son with Asperger’s Syndrome and a threenager. Echo’s blog is hilarious and she’s not afraid to voice the thoughts we all have as parents. 1. Your blog name reminds me of a fairy. Do you believe in magic or making things magical for your girls? Sylva is an old English word from the Latin silva, meaning woodland. It’s also the name of my youngest; my little child of the woodlands. Fae are faeries hence SylvaFae = woodland faerie. I believe in the natural magic that the woodland brings out in children. These magical experiences are the memories they’ll hopefully treasure when they’re older (I know I do.) They drive their imaginations and spark creativity as well as being good healthy exercise in the fresh air. I just don’t want my girls to grow up too quickly. 2. We have Santa, The Tooth Fairy, Easter Bunny and Garden Fairies. Do any other magical being visit your household? We have all the above plus we have a little cat and mouse. My eldest was prone to the most outrageous terrible twos tantrums and they could go on long after she’d forgotten the original reason. On one of these days, I’d tried everything to console her but nothing worked. Eventually I wandered to the window to take a moment and gazed out into the garden. I spied a cat hiding in the bushes and mused out loud “what is that cat doing?” Immediately she stopped and her natural nosiness took over; tantrum forgotten. I used an imaginary cat from that point on – the perfect cure for tantrums. My second daughter had an imaginary little mouse who could get her to jump in bed and settle off to sleep quickly – fabulous! Sadly our littlest was too clever for us and matter of factly stated there was no cat. Oh how I wish those little animals still worked on rowdy rascals at bedtime! 3. You and I both love raising readers and encouraging our kids to read. What are some of your girls’ favorite books? They’ve all loved the books by Julia Donaldson; such amazing illustrations and lovely to read. Recently we’ve shared Enid Blyton’s The Faraway Tree and Astrid Lindgren’s Pippi Longstocking. I enjoy reading them the books I loved as a child, as well as trying books by new authors, such as Russ Brown. 4. If you could be any literary character, who would you be and why? Oh how to choose – can I be several? My dad often called me Pippi Longstocking due to my long legs and socks that were always falling down. It’d be fun to have the freedom to be Pippi for a day. I’d also like to live as a Borrower for a short while; I think I’d be very resourceful at acquiring useful items from the big people. Most of all I’d like to be Nurse Matilda from the book by Christianna Brand – it was made into the film Nanny McPhee but I think the book is much better. I’d raise my stick every time one of my little rascals was misbehaving, then bang it down to cure their naughtiness with a sprinkling of magic. 5. If you could live in any literary world, where would it be and why? I have an old wardrobe at the top of the stairs, how fun would it be to slip through into the woods of Narnia once in a while? I’d set to sea on the Dawn Treader with Reepicheep and take tea with Mr Tumnus and of course a visit to Narnia wouldn’t be complete without an audience with the great Aslan. I’d pick Narnia because where else could a sylva fae wander the woodlands with talking animals, dryads, niaids and nymphs, dwarves, fauns and winged horses? Just magical! 6. My daughter loves imaginary play and dressing up. Do your girls have a lot of dress up things? Oh yes! The dressing up box has multiplied to four boxes and they’re still overflowing. My girls may be mucky tomboys when we’re romping through the woods but they easily transform into fairies and princesses. Each year I have the challenge of creating literary character fancy dress for World Book Day – my favourite has to be little Sylva as Peely Wally’s baby. 7. I have always wanted to puddle jump and visit the UK. What is something I would have to see if I did? So many beautiful places to visit! If I had to pick, the Lake District is amazing. I have so many happy memories of family holidays there, but bring a large selection of clothing, you’ll have to contend with the unpredictable English weather! 8. I am a huge fan of quick and easy meals. Is there a quick and easy meal that is a go-to in your household? I love to make stews in the winter. Just throw a random selection of ingredients in a stewpot, go out for the day and then come home to a hot and hearty meal. Serve with a large chunk of crusty bread – lovely! It’s also a great way to get three fussy eaters to eat vegetables. 9. Coffee, Tea or other. What is your mom fuel? Coffee. Always coffee. I’m not awake and functioning until I’ve had at least two cups. 10. What is one thing that you would like everyone to know about your blog? I love to get comments. Sometimes it feels like I’m the only one reading it so it’s so nice to see a comment pop up. I blog about our adventures in our little woodland and my children’s escapades. I enjoyed reading this blog,as Sylva Fae’s Mum and Nana to the girls it reflects the magical world those littlle girls live in,I love sharing all their adventures.It proves the importance of reading and playing with your children and believing in their magical world ,this stays with you for life.My Grandma always spent time with me and I In turn did the same for my daughter she now is doing it with her little ones. Yes I did! I have some fabulous memories, mainly including laughing hysterically, so thank you mum! If I can make my children’s childhood just half as great as mine, then I’ll know I’ve done a good job. I couldn’t be happier with your answers and this swap! I adore the fact that you would be Pippi! We just introduced our kids to the Pippi Longstocking movie last week! I truly love the meaning behind your blog name and the cat and mouse idea? BRILLIANT! Stews, soups and chilis are my favorite things in the winter. Especially when you just through them in the crock pot! I am so happy that you joined us in Ask Away Friday and I hope more people find your little enchanted wood! Thank you! I had great questions to answer. 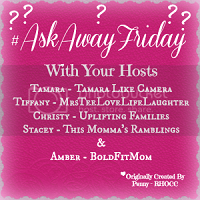 I just stopped by your blog and saw the #askawayfriday tag… What a neat idea! I loved Pippi Longstocking books and music cassettes (remember those?) when I was a kid! But never dressed up as her…legs were way too short, haha!